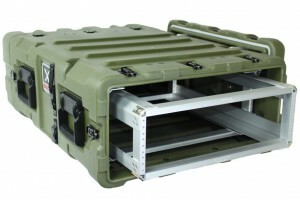 Today, AMERIPACK announced a new case in its offerings of Excalibur Rack Mount cases. This case features a 3U high rack mountable frame in a compact rotationally molded shell. The 24” deep design is the most versatile size in the industry. Available in your choice of color and hardware features, including a fixed or removable rack frame, the AP3U-1924SO is stackable with all of the other Excalibur case sizes already available.